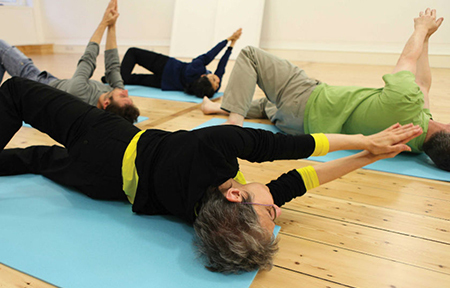 The main idea behind the Feldenkrais Method is becoming aware of subconscious tension and holding patterns that make your movements less efficient and actually interfere with what you want to do. You body can become stuck in habitual patterns, causing you to overuse some muscle groups and underutilize others. The “fix” is getting your brain to wake up and learn more efficient movement patterns that aren’t done compulsively and automatically. By moving slowly and gently, learning to reduce effort and strain, you can break out of motor habits that are self-limiting and re-creating pain. The emphasis is on learning new movement patterns, through attending to yourself while moving slowly and gently, thereby coordinating different parts of your body to work together, providing integration that builds strength spontaneously. Based on the art of judo, which stresses as its primary aim “to move with maximum efficiency with the least amount of effort, through increased consciousness of how the body works”, Feldenkrais simulates similar mind/body integration. Inefficient body organization leads to excess tension and pain. Especially after injury, physical and emotional trauma, surgery and chronic pain; we compensate and use our skeleton poorly; which leads to fatigue, arthritis, insomnia, and never fully resolving the painful condition. Learning to move more efficiently through improved coordination results in less excess tension, muscular spasm and pain and internal stress. Learning to move from the center of our body leads to more relaxation, flexibility, better posture and breathing. By adopting new movement choices, one can see a dramatic reduction in pain almost immediately. 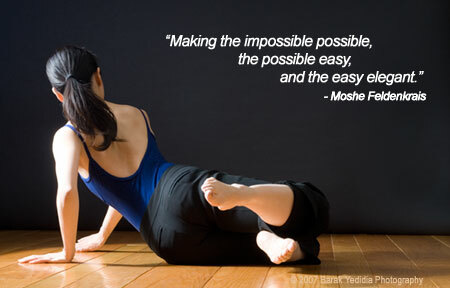 Feldenkrais helps in better organization of the body. This is achieved though attending to yourself and the Process at hand, rather focusing on the Result. Instead of focusing on mindless repetition and strain, the movement exercises are varied and done within a spirit of exploration and curiosity, leading to less effort in the body. The idea is to move away from automatic, compulsive, effort laden movement, to having free choice. Learning to find “neutral” and move in any direction without preliminary reorganization (unnecessary extra steps taken to do what you want to accomplish). Learning to find the comfortable range of movement without effort. Much the same way an art student learns “to see” or a musician learns to differentiate notes and chords, Feldenkrais students learn to sense and feel themselves from the inside out. While attending to their movements they learn greater awareness of how they move – how each muscle moves – without having to think about it. Through self-sensing, we can step outside the habits we have learned and absorbed from teachers, parents and society over a lifetime of conditioning. Rather than moving spontaneously as we did as children and infants; we become “stuck”, stop learning and repeat the same unconscious effort laden strategy over and over. Quiet the mind and focus the Nervous System. Through Feldenkrais, we quiet the mind and focus the Nervous System. We allow the Process to happen. Having flexible bite size goals. By not getting stuck single-mindedly pursuing our goals with pain and distress, we become open to new possibilities along the way. This improves the quality of our vitality, while being able to accomplish what we set out to do easily and effortlessly. After a session, the immediate sensation is one of calm. We feel refreshed as if we have awoken from a good night’s sleep or a short power nap.